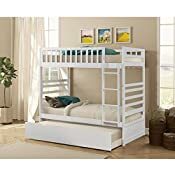 Description: The twin sized Merax Bunk Bed with trundle is constructed of solid wood making it a perfect and durable choice for kids and adults. 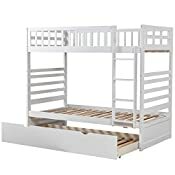 With its space saving capabilities, it also suitable for guest rooms, dorm rooms, lofts and any area that is in need of space saving solutions. 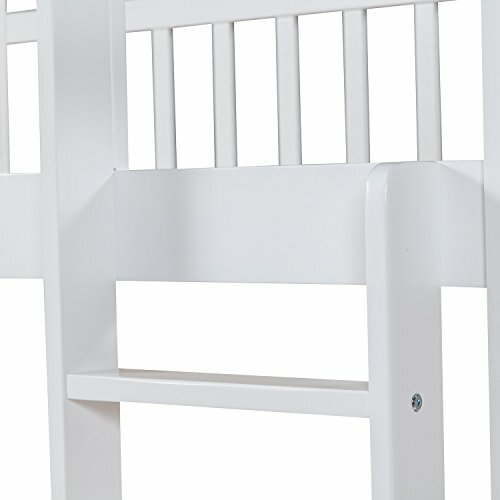 Complete with a lead free deep chestnut finish, the bed surface is sanded and smooth coated to prevent splintering. 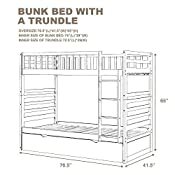 Flat Ladder rungs are flat make it easy to access to the top bunk, while included slats provide optimum support; both bunks comes with 13 slats and the trundle with 12.Trundle rolls out on casters. 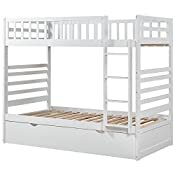 Purchase does not include mattress or bedding. 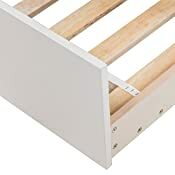 6.Ensure thickness of mattress and foundation combined does not exceed 6" and that mattress surface is at least 5" below upper edge of guardrails. 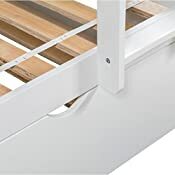 Strangulation Hazard: Never attach or hang items to any part of the bunk bed that are not designed for,for example,but not limited, hooks, belts and jump ropes.